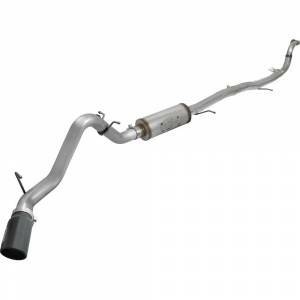 This Large Bore-HD exhaust system is constructed of 3" mandrel-bent stainless steel tubing for maximum flow. Smooth transition bends allow for low turbulence, increasing horsepower, torque and lowering EGT’s. Finishing off the exhaust is a 4-1/2" diameter, black, stainless steel slash cut tip with a unique stainless steel laser-cut aFe Power logo plate riveted on for an aggressive style.